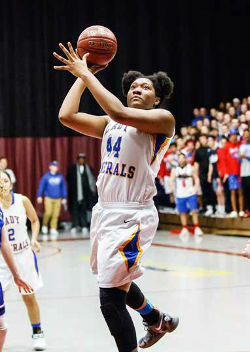 One of the most prestigious awards in high school sports has been bestowed upon Sydnee Roby, a junior at Rufus King International High School. Sydnee was selected from hundreds of student athletes based on her athletic excellence, academic achievement, and exemplary character. The winners were announced to the public on Facebook Live. Sydnee maintains a 3.09 grade point average and volunteers at a local homeless shelter. A 6-foot-4-inch center, she averages 17 points, 11 rebounds, 2.7 blocks, and 2 assists per game. She has been a two-time Conference player of the year, was a unanimous First Team All- State selection as a sophomore, and was named to the Associated Press All-State First Team and the USA TODAY ALL-USA Wisconsin First Team. Sydnee will also select a local charity or sport association to receive a $1,000 donation from Gatorade, and has the opportunity to nominate her school for a $10,000 grant from Gatorade.